This pant features a relaxed fit, slightly flared leg, full elastic waist design with drawstring closure, multi-pockets all in front, vented leg openings, and an 18" leg opening. Regular inseam: 31½". Petite inseam: 29½". Tall inseam: 33½". This mock wrap top features princess lines, bungee cord loop that easily holds an ID badge, signature zipper pocket, side vents, and five pockets. Center back length: 26". This warm-up jacket features a rounded neckline with snap front, front and back princess seams, and soft-stretch color-matched knit cuffs. Center back length: 28". This sporty v-neck top features princess seams accented with contrast piping, two pockets emphasized with double-needle contrast topstitching, and contrast band inside shirttail hem. Center back length: 26". 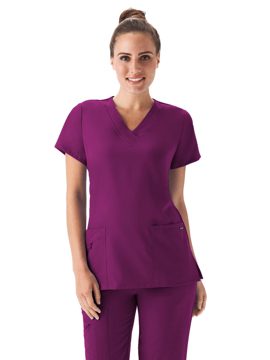 This v-neck top features a highcross neckline, bungee cord loop that easily holds an ID badge, signature zipper pockets and patch pockets, and side vents. Center back length: 26". This warm-up jacket features a rounded v-neckline with zipper closure, soft, stretchy color-matched knit cuffs, and roomy patch pockets with hidden cellphone pocket. Center back length: 28". This pant features a convertible drawstring waist that lets you choose between mid-rise and low rise, triple-colored waistband, cover-stitch details, and a 18" leg opening. Regular inseam: 31½". Petite inseam: 29½". Tall inseam: 33½". This athletic-inspired fleece jacket features princess seams, a stand-up collar, full zipper closure, earbud holder on zipper, two front pockets, and one hidden zipper pocket. Center back length: 25½". This mesh-trim top features a narrow v-neck band, mesh around the arm and back of neck to offer breathability, innovative mesh panels, curved mesh-trim pocket, and front and back princess lines. Center back length: 25½". This flattering v-neck top features a contrast back neck facing and bar tacks, front and back princess lines, T-shaped back yoke, double patch pockets plus one security pocket with zipper, and side seam hem venting. Center back length: 25". This top features a shaped v-neck, body mapped mesh venting, double chest pocket with texture detail, action back details, and reflective Jockey logo. Center back length: 28". 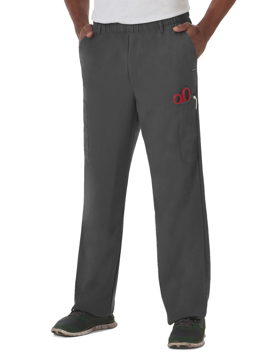 This pant features textured full comfort elastic waistband with inside tonal twill tape tie, two contrast full side hip pockets, two streamlined back welt pockets, gusseted inseam, fully functioning zipper fly, reflective Jockey logo, and a 17" leg opening. Regular inseam: 31½". Tall inseam: 33½". This layering tee features rounded comfort collar with set in sleeves, athletic-inspired x-back detail, and hi-low shirttail hem. Center back length: 25".